Today was a pretty leisurely day. 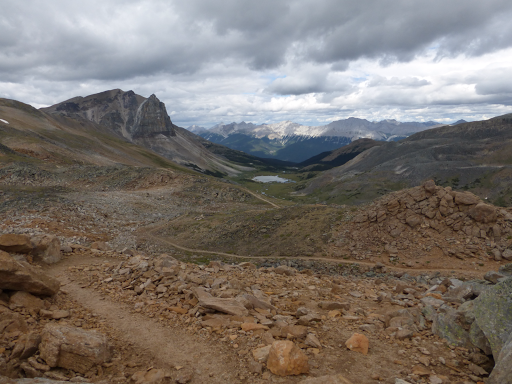 We were hiking the Skyline Trail, one of the most popular trails in the Canadian Rockies. Since we knew this would be a day to cruise on a well maintained trail, we decided to each do our own thing. 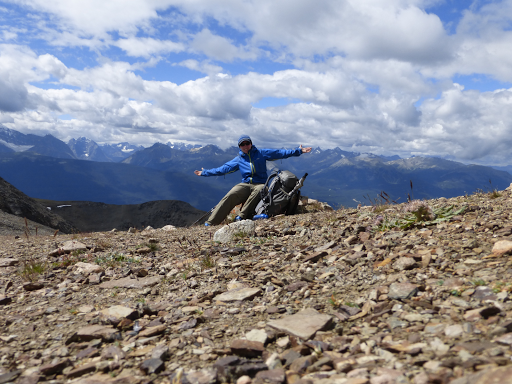 Gian and Lara have a campsite reserved a half day away, so they slept in today and we will probably see them in Jasper or the next resupply stop of Mt Robson. I left at my routine 6:30am and E slept in a bit and left around 7am. It was a day on autopilot as my body was able to cruise and just take in the sights. Most exciting was that after a brief period of cold and a bit of wet brush along the trail, I was able to hike without rain pants! Most of the last four days were spent in rain pants. The rain stopped around 5:30am this morning and it stayed dry all day, yay! You can see by the elevation chart that there were three climbs (which were very nice) and then the rest of the day was downhill. 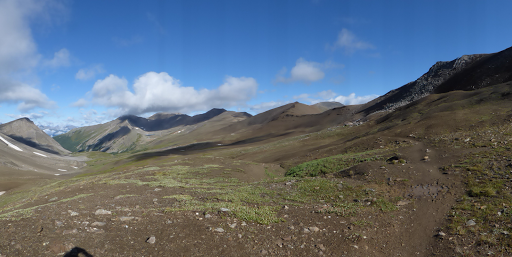 The morning climb up to Little Shovel Pass was a gradual forested climb and then up a valley surrounded by smoother rounder mountains. 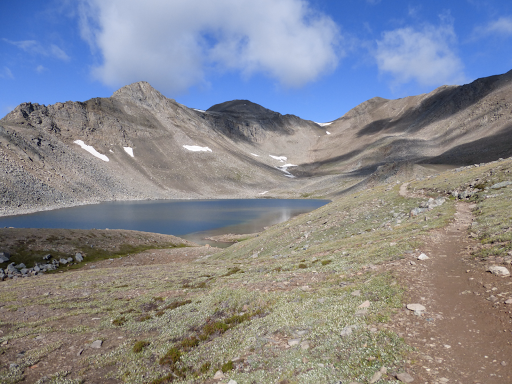 Once out of the forest, most of the rest of the rest of the day was well above tree line. I listened to the audiobook, Outlander, most of the day. It was nice to have something to listen to since this trail was less mentally draining than what we’ve been doing lately. It really was a cruise. 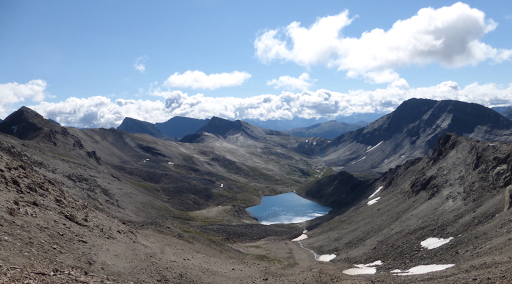 The big view of the day was The Notch with a nice climb by a lake and then a great view of the neighboring range stretching as far a I could see. I love days with clouds like these that rest just above the mountains. I got to The Notch around 11am and sat up there for 2hrs because it was the first cell service I was able to get in a week! I got lots done and people came and went. E even came up and had lunch and then hiked on. 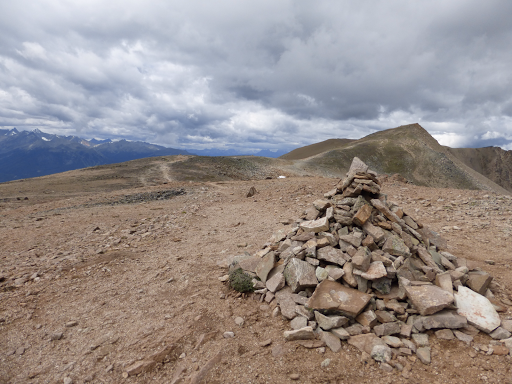 It was quite gusty up along that ridge and it was brisk out. I had my beanie, gloves, and rain jacket on most of the day. It was also a nice day for wildlife. 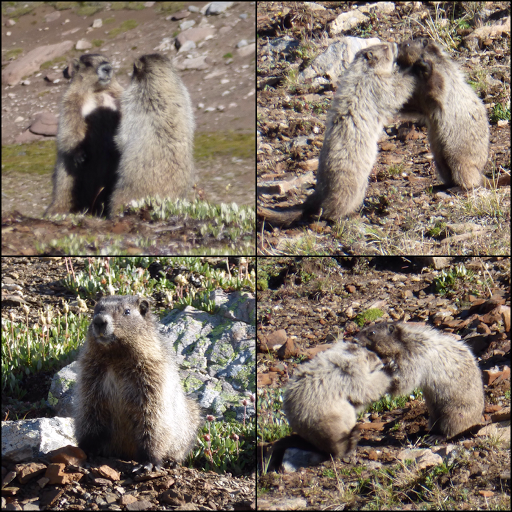 Tons of marmots posing for photos today. Two even put on a show as they rough housed. 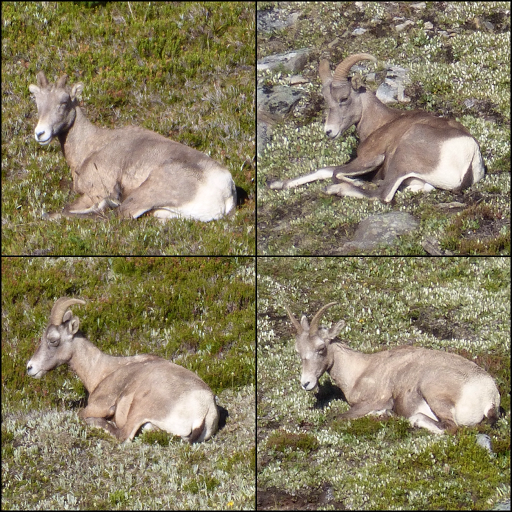 I also saw about 10 female bighorn sheep just chillin’. I was surprised I didn’t see more people along the trail. Maybe it was the rainy day yesterday. 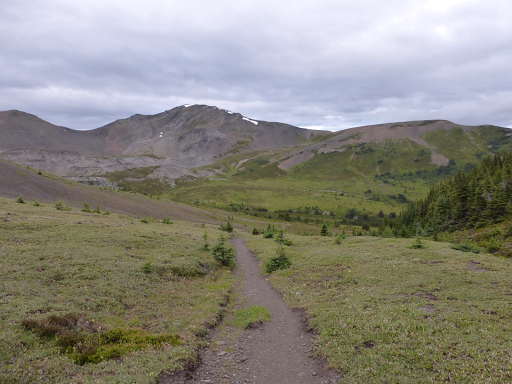 After lunch, it was a ridge walk and gradual downhill on rockier terrain until dropping into a valley that then contoured up and around to our final destination of Signal Mountain Campsite. Timing was perfect as I caught up to E just minutes before we hit the campsite… Not the most impressive spot with mostly muddy uneven sites. There are quite a few people here since the trailhead isn’t far. There are more people here than official sites and it’s Friday night, so I’m sure some are here without a permit. 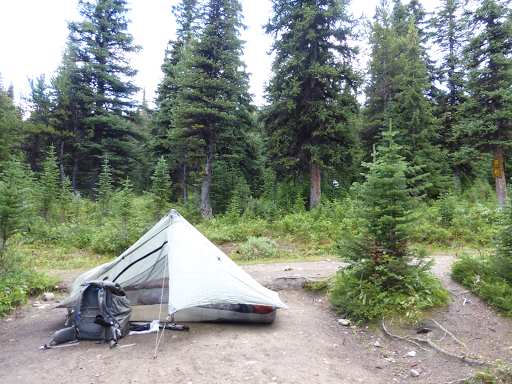 While I was away eating dinner in the designated food area, a guy decided to pitch his tent ten yards from my tent when other official spots were still open…and cooked dinner there. Not ok in grizzly country dude! It was already too late by the time I noticed. E’s tent is on a spot in the trees behind my tent. 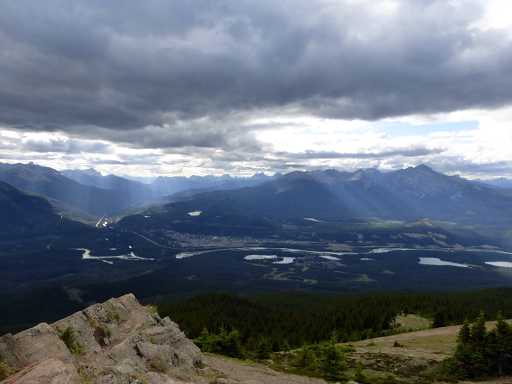 After dinner, E and I hiked up the short side trail to the viewpoint overlooking Jasper. 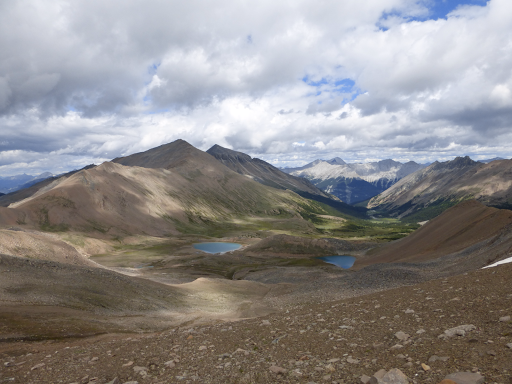 Great view and a fun way to see Jasper before we arrive tomorrow and then take a zero the next day. It’s pretty small. Yep, town tomorrow! Our last official town stop (and shower!) was Field 10 days ago. That shower will be ahhmazing tomorrow!